Discovery provides clues to development of neurological diseases and cancer. Researchers at the Salk Institute have discovered a startling feature of early brain development that helps to explain how complex neuron wiring patterns are programmed using just a handful of critical genes. The findings, published in Cell, may help scientists develop new therapies for neurological disorders, such as amyotrophic lateral sclerosis (ALS), and provide insight into certain cancers. Funding: The study was funded by the National Institute of Neurological Disorders and Stroke and by the Howard Hughes Medical Institute. 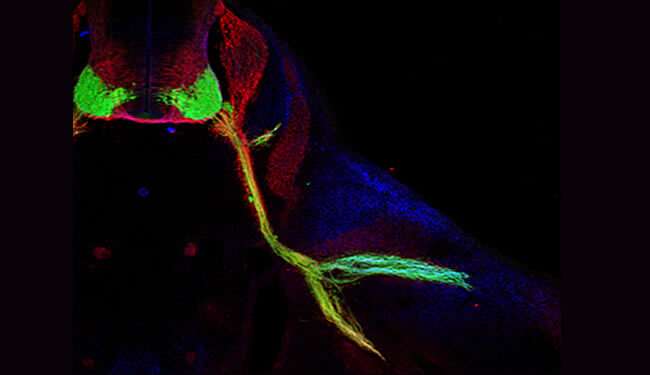 Wiring of the nervous system may depend on only a few genes/proteins. Problems a few can have pervasive effects. February 11, 2012 Georgia Gigi C.